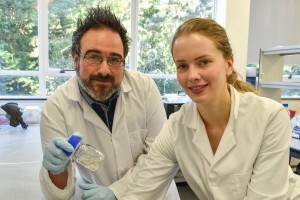 Scientists at Aberystwyth University’s IBERS are well known for their research into agricultural animals and plants, but now a team of young researchers at the Institute are embarking on a new project to evaluate how a parasite which can affect giant pandas responds to anti-parasitic drugs. Dr Russ Morphew and PhD student Cat Pye are working with Iain Valentine of the Royal Zoological Society of Scotland (RZSS), the conservation charity that owns and manages RZSS Edinburgh Zoo, with links to Chinese research centres, on a three year project to identify how the parasite responds to anti–parasitic drugs and, more specifically, whether drug resistance is the cause of repeat infections in captive giant panda populations. The project has been awarded CASE studentship funding by the BBSRC (Biotechnology and Biological Sciences Research Council). This is a collaborative training grant that will provide Cat with a first-rate, challenging research training experience, allowing her (as a top quality bioscience graduate) to undertake research, leading to a PhD, that is of benefit to her and the partner organisations involved. Giant pandas, the international symbol of conservation, are one of the most loved species in the world. In a similar way to domestic dogs and cats, giant pandas can be affected by a panda-specific parasitic roundworm called Baylisascaris schroederi. If left unchecked in the wild the roundworm can be fatal, as infection from the parasite can cause damage to the intestines and ultimately reach the brain and eyes.